Anyone who says breakfast is the most important meal of the day has obviously never had dessert. And in case you’ve been living under a rock, you’d already know that Burleigh is about to welcome its first dedicated dessert bar. That’s right, it’s time to say sayonara to your bikini body! 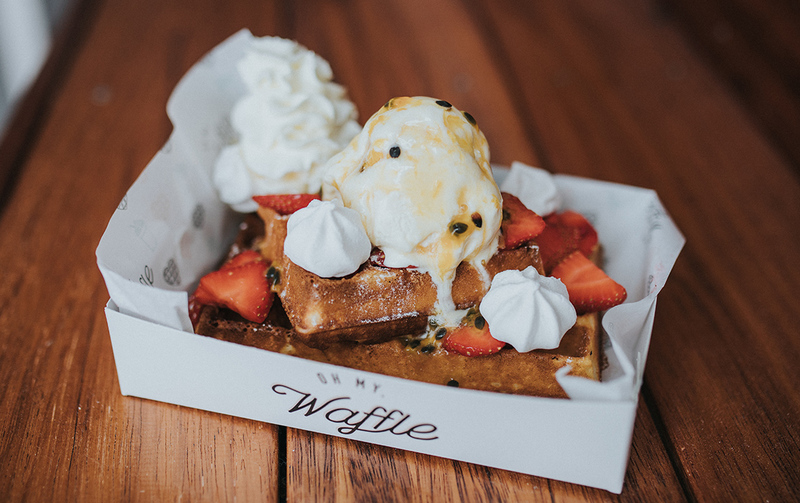 This weekend, Saturday 3 February, Oh My Waffle will pop open its doors on the ‘other side’ of the Gold Coast Highway (next to Rabbath and Slice Pizza) in a slowly expanding dining hub following the departure of gym, First Choice Fitness (how ironic?!). Even sweeter than the desserts are owners and partners in crime Courtney and Jessica, who somehow manage to stay surprisingly slim (everything in moderation, right?) and are confident their new post-dinner dessert bar (or is it a straight up meal replacement?) is just what this bustling pocket of the Coast has been missing. We’ve sacrificed our waistlines already, popping in early to sample drool-worthy waffles including, our early fave, the More Bang For Your Meringue: a golden waffle topped with passionfruit pulp, strawberries, whipped cream, ice cream and cute mini meringues. Or the Banana Bounty Hunter; a pair of fluffy waffles piled high with fresh banana, Whitaker’s creamy milk chocolate, chunks of Bounty bar, ice cream, more whipped cream and a fragrant dusting of coconut. For anyone throwing caution (or calories) to the wind, we suggest getting amongst the Kinder Before Tinder or Alice In Waffleland next… Seriously, how cute are these names?! There are even two vegan-friendly waffle options for all you animal lovers out there, with all waffles priced at a very reasonable $13 each ($16 for vegan options). 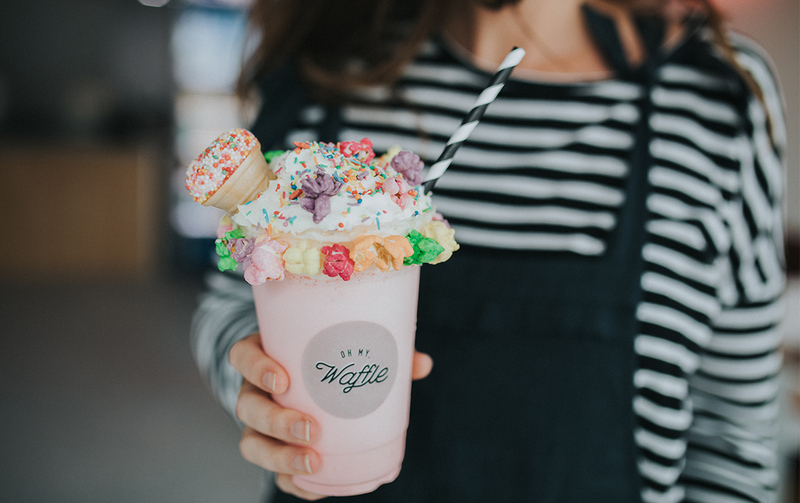 If you can go past the waffle selection (which we highly doubt), leave room for Oh My Waffle’s crazy shakes including their Insta-worthy I Want Candy: a bubble gum milkshake adored with colourful popcorn, whipped cream, rainbow confetti and a sherbet cone. Lord have mercy on our waistlines! When the temps drop, we’ll be back to warm up with pimped up hot choccies, starting with the red velvet cake batter filled Drop It Like It’s Hot, which comes rimmed with red velvet crumbs and topped with red velvet cake. Salivating yet? Yep, your dentist already hates you, so forget the guilt, ‘cause you know what they say... YOLO. 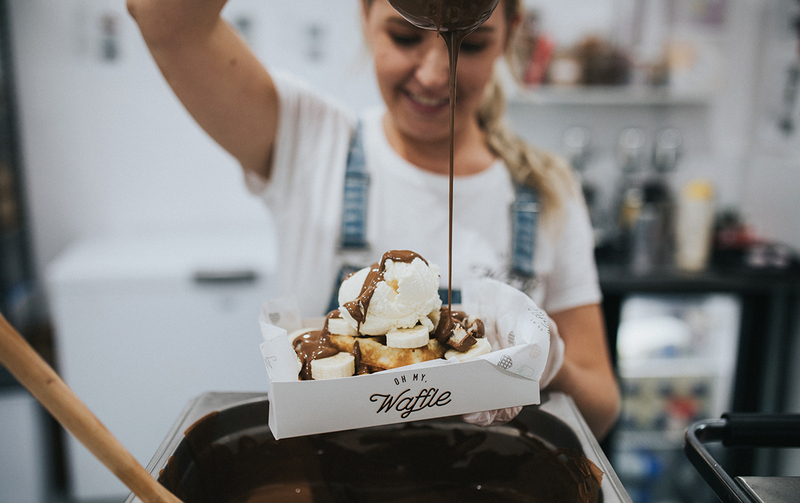 Oh My Waffle is ready to make your dessert dreams come true from 11am this Saturday 3 February—and with a ridiculous offer of half price waffles on opening day, we expect the ladies will be under the pump so bring a smile and your patience, it’ll be worth it. Looking for dinner before dessert? Hit up one of the best restaurants in Burleigh to prime your stomach.